I wanted to do a giveaway soon, so here it is! 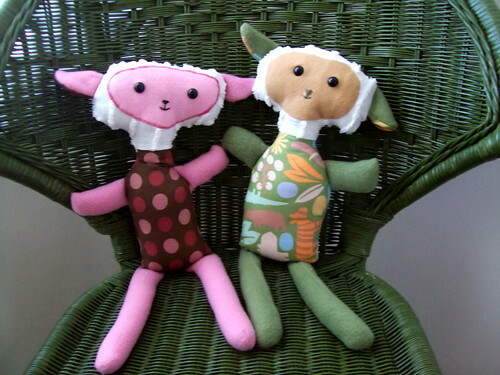 In honor of spring, I am giving away these two lambs. I made them with no pattern to create a whimsical look. They are made from cotton, fleece, and vintage chenille. I have used safety eyes on them and toys with such eyes are not recommended for children under three (so if a little one is playing with them, make sure they are supervised!). To enter, just leave a comment and make sure I have a way to get in touch with you if you don’t have a blog. If you would like a second chance to win, post about this giveaway on your blog and leave another comments saying you posted it. This will run until April 10, 2009 at midnight and then the winner will be announced. They are absolutely adorable! The fabrics you chose accent the vintage chenille perfectly! I love the sweet green one. I love them Jessica!! They are both judst too cute! I love them! They are a prefect doll for the Spring time. Ao so cute and perfect for spring. Great work. Thank you for a cool giveaway! So cute and I love the fabric choices. Darling! My daughter and I are all about sheep this year. These are too cute. I wish I had your talent. Ooohhh, they’re sssooo cute! I wish I could win! I simply love them! Please count me in. 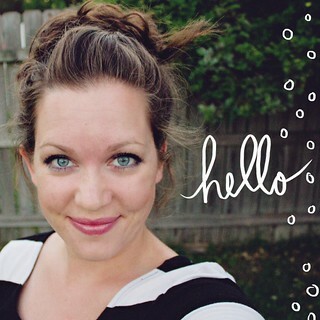 Hi, I’m Alice and this is my first visit to your blog. Thanks for the giveaway! I love the adorable lambs! Please enter me! I’d love to win. they are so adorable, I’m very impressed that you can do it without a pattern…I feel like I need a pattern for everything! These little guys are sooo cute! I would love to give one to my niece for her birthday!! SOOO cute! My little girl would love a lamb! I wish I could sew like you! Thanks for the sweet springtime giveaway! Could these things be any cuter!!! You are truly talented and I love that you are a believer! Love the connection of the Lord being our shepherd…not sure if that is what you were going for but love it none the less! such fun fabrics and sweet combinations! How cute are these and how fun for Easter, love the fabric choices and would love to win. thanks. Please enter me into your giveaway. These little lambs are toooooo cute! Those are so cute and my youngest loves anything she can snuggle and carry around. These lambs are so cute! My daughter would love them. Those are so cute. I love the chenille as lambswool. What a good idea. I received my lambs today (1st blog giveaway I’ve ever entered, and I won)!! The picture didn’t begin to give them justice – they are precious & I love them! One will be for my 3 year old granddaughter’s “I’m the Big Sister” gift bag & the other for her new baby sister’s “I’m the Little Sister” gift bag when she arrives in a couple of weeks. Thank you, Jessica! Awwww, they’re so cute – maybe I’ll just keep them (LOL – just kidding)!